1. Identify the risks: Recognize places and situations where your gluten-free child may face risks. According to the National Foundation for Celiac Awareness, risks include school cafeterias, field trips, home economics, sports and clubs. 2. Educate and empower: Make sure your child is aware which foods are off-limits while simultaneously teaching them the positive side of eating gluten-free. Gluten-Free Living has all the info on the basic diet. 3. Communicate with teachers: Talk to your children’s teachers about having what Amy Leger, Gluten-Free Living family editor, calls “back-up gluten-free treats” on-hand for special classroom occasions—for instance, frozen gluten-free cupcakes for school birthday parties or gluten-free snacks that the teacher can give your child when others are having a treat. 4. Encourage awareness: Leger suggests asking schools to initiate a dialogue about gluten-free eating. This will help your child avoid bullying, teasing and other stressful situations like being asked to explain their “strange” eating habits. 5. Confidence is key: Prepare an “elevator speech” your child can use to explain his or her dietary needs to any inquisitive classmates. Dr. Margaret M. Richards, a pediatric psychologist at the Cleveland Clinic Children’s Hospital, says that this will boost your child’s confidence and allow him or her to avoid the anxiety caused by telling others about their gluten-free diet. 6. Include fun and easy-to-handle foods: Pack lunches with food that is not only easy for your children to eat, but also fun. Examples are finger foods, including gluten-free chicken nuggets and interesting gluten-free pasta shapes such as ziti, penne, rotini or animal-shaped pasta. Children also enjoy dipping their food. Sabra Hummus and Wholly Guacamole are great examples of gluten-free dips. 7. Keep it “normal”: According to Amy Ratner, editor of Gluten-Free Living, one of the biggest concerns of gluten-free children is the feeling that they are not like other kids. 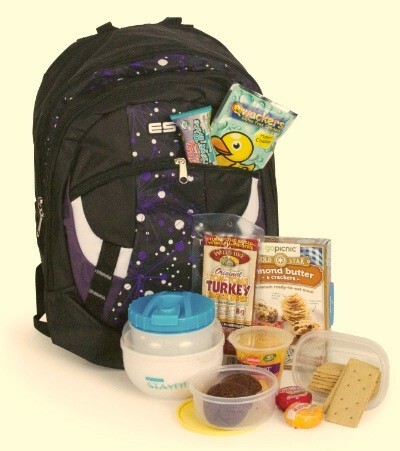 Make sure the lunches you pack reflect what other kids are eating in the lunch room. A wide range of gluten-free versions of kid food—from pizza, pretzels and animal crackers, to bagels, sandwich cookies and chicken nuggets – are available. 8. Ensure variety: Research and try the vast range of gluten free-foods that are out there. This way you can shake things up and keep your children’s lunches interesting, promoting their comfort with a gluten-free regimen. Check out the National Foundation for Celiac Awareness site for a back-to-school meal and snack guide. 9. No limitations: Don’t let a gluten-free diet keep your children from enjoying fun events and outings with other kids. Make sure they attend sports events, parties and participate in other activities. You want them to see that eating gluten-free is manageable and doesn’t restrict them in any way. Just be prepared in advance with gluten-free food options your child can take along or get at the event. 10. Offer a treat every once in awhile: While your goal is to provide healthy lunch options, gluten-free children deserve an occasional lunch or after-school treat. Take a look at these gluten-free dessert recipes on Parenting.com for inspiration. It will help kids feel less deprived and won’t ruin an overall healthy eating plan if it’s a once-in-a-while occurrence.